Matchbox in Short Pump proved it was up to the task of a fine dining experience last week, providing a communal atmosphere along with fantastic food from a local chef paired with local craft beers. Partnering with Hardywood Park Craft Brewery, the brick-oven pizza chain held a beer dinner catered by renowned chef Kevin LaCivita, who ever since he closed his European restaurant Pomegranate in Carytown in 2016, has been consulting at Bistro Coquette in Raleigh and Lake Anna’s Callie Opies Orchard. But on Thursday evening, LaCivita made quite the comeback and reminded Richmond foodies just what he was capable of with his five-course menu. 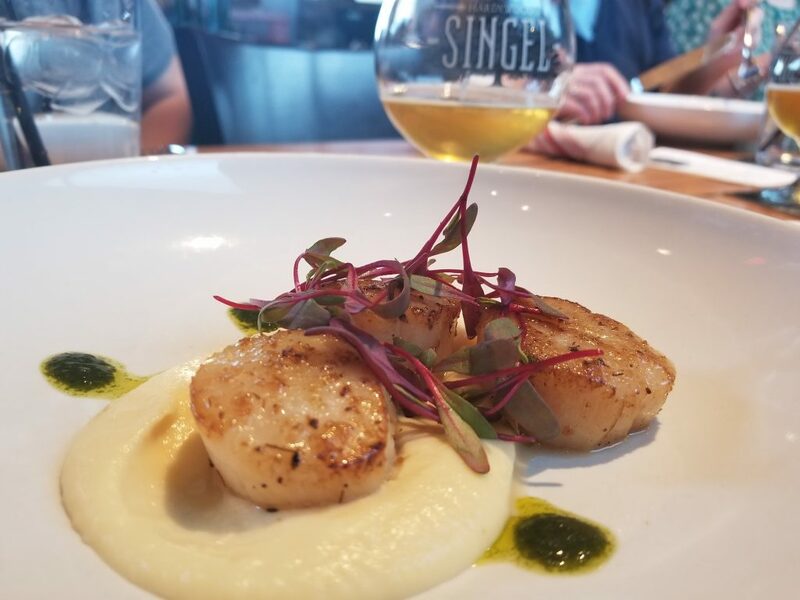 The Hardywood Singel, The ever-expanding brewery’s flagship brew, kicked off the evening, paired with fennel pollen-crusted scallops, which were served over a parsnip puree. Now having been brought up in the fine dining atmosphere, I quickly learned the best appetizer comes with a crunch. This dish, universally soft in texture, stood apart with a collision between the soft and savory embodiment of the scallop with the crunchy fennel resting over the top, making for that perfect bite. The scallops lightly sauteed, practically melted once you took a bite. The parsnip puree was buttery, almost dessert-like in its subtle, yet sweet delivery. While not particularly a fan of the Singel, the golden Belgian blonde ale paired well the first dish and prepared my palate for the deliciousness that was to follow. 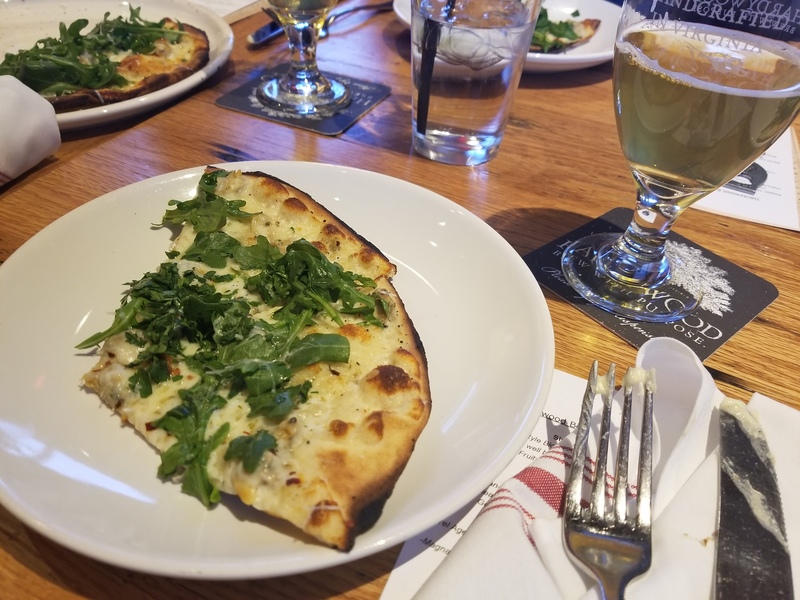 The second course was a New Haven-style white clam pizza, paired with the Hardywood Pilsner, another one of the brewery’s flagship beers. The group I was seated with, far more vocal about their hunger after the morsel of a first dish, was surprised (myself included) upon learning each pizza was shared between two guests. 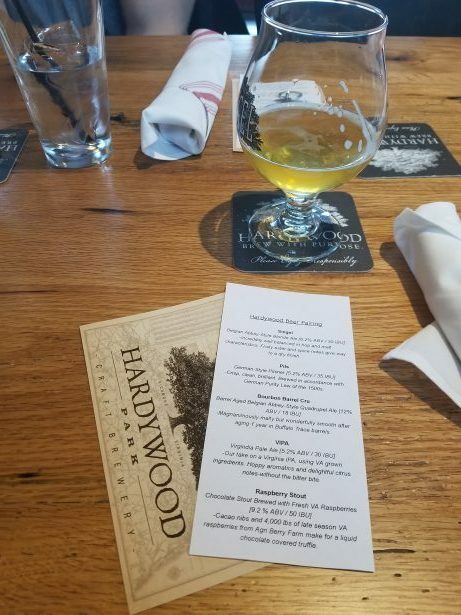 Though once the dish, along with the continuously delectable Hardywood Pilsner, was served, the chatter was silenced and formalities dropped; it was dinner time. Hungry attendees eyed the pizza with delight, and I wasted no time diving in. 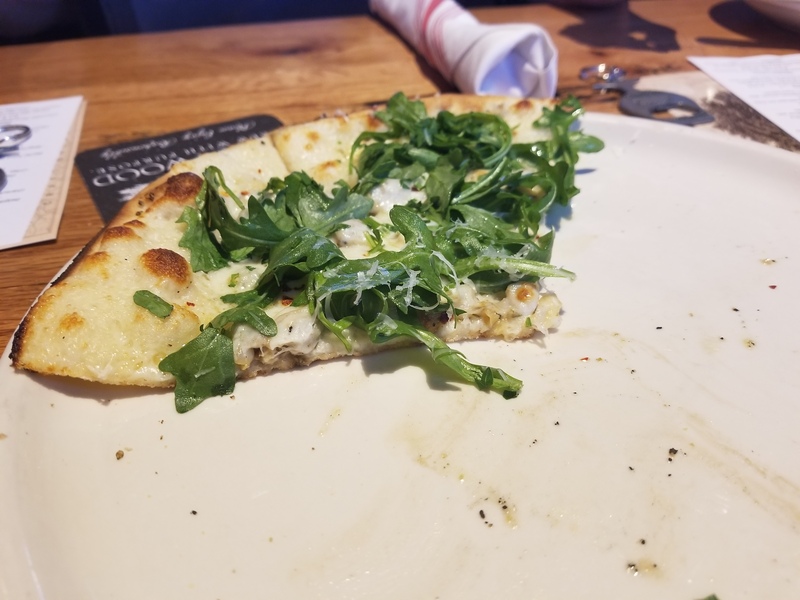 The thin-crusted pizza was piled high with arugula, providing a peppery bite to the puffy pizza and salty Parmesan cheese below it. The clams -the unsung martyrs- were stuffed under light blankets of alfredo cheese, all of this topped by some lemon zest which when combined packed quite a punch for this course. Intermixed among the lemony brightness of the dish, was a light spice that accented the clams that was a crowd pleaser, and the accompanying classic crisp lager from the brewery was a decent choice for the pizza. The dish overall, not bad. Personally, I feel the dish would have been better on a thicker crust, the density failing in some respects of consistency, but a fantastic and surprisingly light dish regardless. The third course was not so much notable for its texture. Not taking away from the dish, it was delightful. The presentation- pristine, but with this baked camembert, it was all in the pairing. 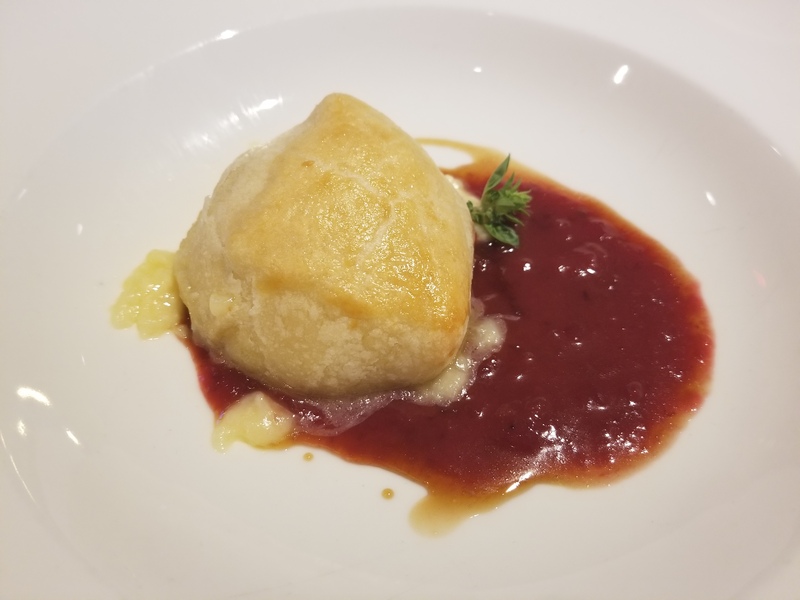 A plum compote and bourbon-barrel gastrique encircled the creamy brie-like cheese, which was coupled with Hardywood’s Bourbon Barrel Cru, an abbey-style quadrupel ale that’s aged in bourbon whiskey barrels. Although not my immediate favorite upon first taste, Hardywood’s quadrupel ale began to turn for the better as it warmed, which my neighbor at the event, a Hardywood brewer himself, attested to be true for all Hardywood brews. It did, however, complement the dish nicely, with the beer’s woody, bourbon caramel notes meshing wonderfully with the fruity compote and savory camembert. For now, I’ll suffice with labeling it the “cheese heaven ball.”. 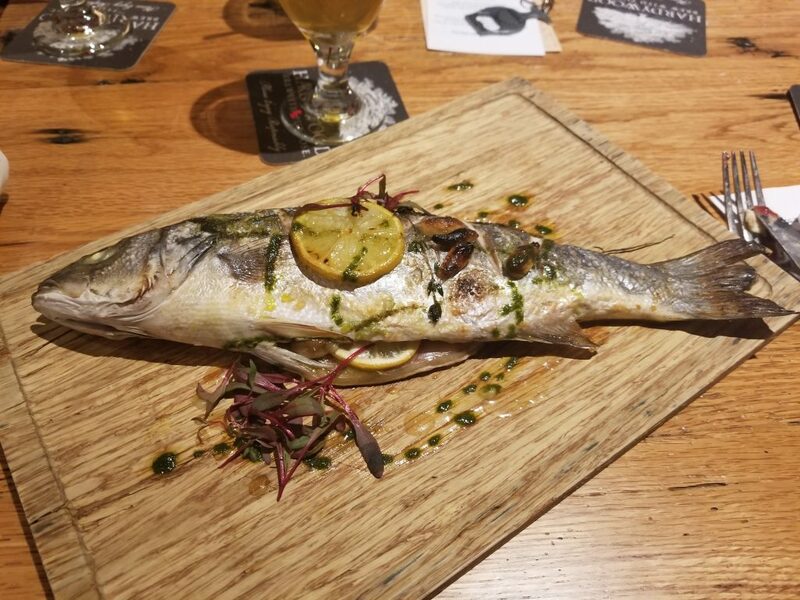 Now we were on to the main event, a wood-fired, oven-salted crusted branzino with candied garlic.The presentation- reasonably avoidable to the faint of heart. Even the title was intimidating. It’s off-putting presentation, despite clear instructions on how to enjoy the dish in its unbeknownst simplicity, was again, intense. 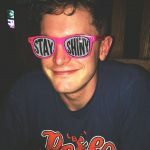 It did lead the group to truly find comfort in another’s company, many ditching their dining sets to dive their way into the crunchy yet sweet lemony texture of the fish. With a flavor beyond comparison in a dish that literally stares back at you, the candied garlic, of all compliments, stood on its own, really bringing out the flavor in this dish. Upon the dish being served, Chef LaCivita made his appearance. Seizing the opportunity, we skipped the polite jargon of the guests around us, ravenously questioning- how one prepares a candied garlic like this, but he wasn’t giving away any secrets. The beer picked for this dish, the Hardywood VIPA, took the backseat on this one. It’s flat texture and medium-body proved unmemorable and not the best pair for the evening. Aside from the somewhat peculiar choice in beer pairing, the dish provided a strong finish to the main dinner that was rooted in primal simplicity. Finally, we were on to dessert. This dish especially had been the one many across the communal table were clamoring about beforehand, The dish, ricotta donuts, was served with bittersweet chocolate raspberry fondue and paired with the Hardywood Raspberry Stout. A donut, something so simple in its presentation, lightly fried and rolled in powdered sugar, found a pleasant and airy way to end the evening. The sweet donuts filled with the smooth, creamy ricotta and the decadent chocolate finish upon each dip into the sauce was a return to the warmest moments of cold winter nights. The stout, made for a fantastic pairing with the donuts, a wintertime treat on a spring evening; a nightcap to a well-catered event.